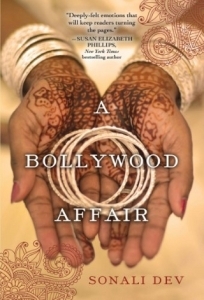 In case you haven’t heard the buzz around A Bollywood Affair, the debut novel from author Sonali Dev, then let me tell you I’ve seen it mentioned by Susan Elizabeth Phillips, Nalini Singh and Kristin Higgins. Um, wow?! I haven’t had the pleasure of reading it yet, but I really can’t wait! Since I attended the Spring Fling conference hosted by Chicago North RWA this past spring, I’ve kept in touch with some of the C-N crew and it turns out Ms. Dev is a Chicago author! 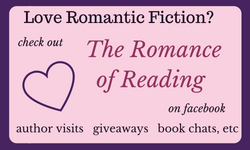 Knowing that fall is a big holiday season in India, I thought it would be fun to ask her to participate in the Read-A-Romance Fall into Romance event, and since I know people who know her, I was able to get in touch and ask her. 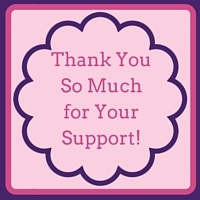 I simply love her post and hope you will too. I have this strange love/hate relationship with Fall. It’s really hard for me to get over the fact that it heralds the coming of winter and as someone who grew up in the perpetual tropical warmth of Mumbai, India, just the idea of winter still strikes terror in my heart. And yet, fall has this wonderful romanticism to it with its artist’s palette of colors, leaves blowing in the breeze and crunching beneath your feet, and just the right amount of a nip in the air for a good cuddle. In India, fall is also Holiday season when all of India lights up and bursts with festivities. I have the most beautiful memories of dancing nine nights away at the Navratri festival which ended with Dusera when we celebrated the destruction of Ravan, the greatest villain in Indian mythology, with some good old fashioned effigy burning. Followed by Diwali, the festival of lights, when our entire neighborhood became one home as we filtered seamlessly in and out of friend’s houses lit up with rows of oil lamps and filled with treats and the smell of fireworks. What is your favorite Halloween candy or treat? I didn’t grow up with Halloween. But I think of it as my mommy festival- given that it’s my children’s favorite holiday thanks to the two pillowcases filled with candy that I get stuck with having to hide in the days that follow. (And no, hiding doesn’t mean gobbling up. Don’t listen to them.) Okay, so maybe I steal all the M&Ms and Hershey bars. I mean, isn’t it our duty as parents to sacrifice our own health for the sake of theirs? Don’t feel obligated to answer that. Here I am slaving over making all these Diwali treats (from scratch, thank you very much)—deep fried dough in every shape and size, some salted and spiced, some dunked in sugar, you know, your usual heaven-in-a-bite formula that transcends all cultural boundaries— because I feel like I must expose my children to this slice of heaven I grew up with. And then they come home with bags full of grocery store candy and I’m burrowing through a veritable ball pit of plastic packets to get to the M&Ms and Hershey bars to save them from more sugar. Truly, the job of a mom is never done. What was your favorite Halloween costume ever? I love this question, because on one hand, I slave away over those homemade Diwali treats so I can connect my children to our heritage, and on the other hand with their insane enthusiasm for trick-or-treating and their Halloween costumes they connect me to our new heritage. It’s this wonderful circle of immigrant life. When they were little I ran the gamut from brainstorming ideas to helping assemble costumes to painting faces. I’ve slashed up dresses for a Zombie Beauty Queen, painted pink noses and whiskers on a rabbit and a puppy, fitted a tattoo sleeve for a biker. This year I’m told I have to blacken some wings for a Goth Fairy Princess of Death (don’t ask), but my favorite costume of all time has to be Fancy Nancy. 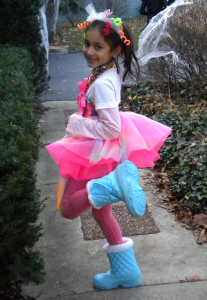 With a rainbow colored tutu, some gift wrapping bows and lots of pipe cleaners I was able to transfer my nine year old into a dead ringer for her favorite book character and can you imagine the joy in that for a writer-mom? Please share a favorite Halloween or Fall-themed book or story. 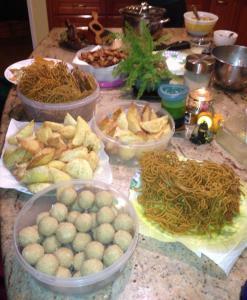 I’m going to have to go back to my Indian upbringing for this one. Like I said before, Diwali and Dusera mark the vanquishing of Ravana (an embodiment of all that is selfish and arrogant and violent) at the hands of Rama (an embodiment of all that is selfless and humble and brave) in the Indian epic Ramayana. Growing up, every Diwali brought a makeshift stage to our neighborhood where plays depicting the Ramayana were performed, including spoofs and musicals and modernizations. That makeshift wooden stage was where I wrote and performed my first play and where so much magic happened. 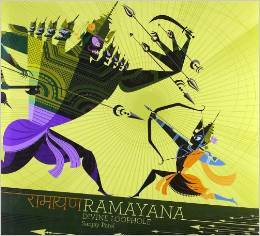 So definitely, the Ramayana with its simple lessons and its familiar cadence and characters is the story of the season for me. You are reading this post at ReadARomanceMonth.com, where in August 93 writers—including some of the biggest names in romance—wrote essays on the topic “Celebrate Romance.” Be sure to check out the 2014 calendar which links to all 93 August Read-A-Romance Month essays, and the 2013 calendar, the first Read-A-Romance Month ever! Love Romance? You’re in the right place. 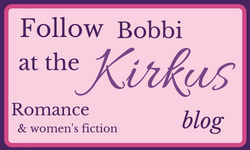 Sonali is generously giving away give away a copy of A Bollywood Affair. If enough people comment, she’ll even give away two. Winners picked from comments below. Drawing runs through midnight CST 10/17. 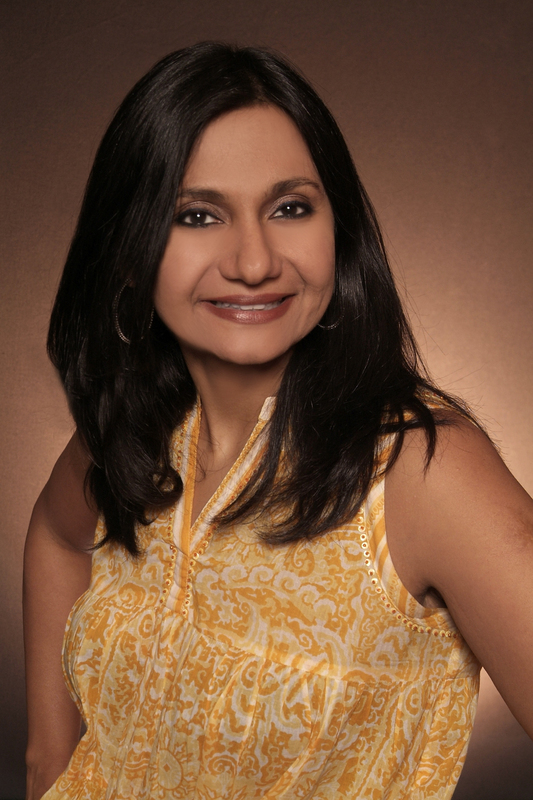 Sonali’s debut novel, A Bollywood Affair, will be available in November 2014. Find her at sonalidev.com.